A couple walk through the empty flower market in the old city and near a sign which reads, "Pray for Nice" days after a truck attack on the Promenade des Anglais on Bastille Day killed scores and injured as many in Nice, France, July 17, 2016. 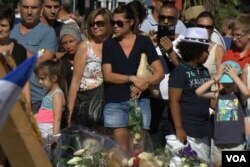 “We thought we might understand better what happened if we came here,” said Giorgio Jaquet, a tennis coach from Nice, gazing at one of many memorials that now mark a two-kilometer stretch of this city's Riviera beachfront promenade. At least 10 children were among 84 people killed Thursday night as families were watching a fireworks display celebrating Bastille Day, France’s main national holiday. 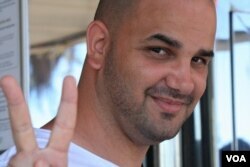 The holiday joy ended when Mohamed Bouhlel, a 31-year-old Tunisian who lived in Nice, tore through the crowds in a large truck, crushing people to death until he was shot dead by police. The death toll is expected to rise beyond 84. At least 20 people still alive are gravely wounded, and others have been seriously injured. Nice, a Riviera city known for tourism and tolerance, remains stunned by the carnage. Some people here are skeptical the attack was planned by a terror group, despite official claims that it was at least related to, if not planned by, Islamic State militants. Islamic State militants say Bouhlel was a “soldier” answering the terror group's call for attacks on countries fighting against IS in Iraq and Syria. The militants have not, however, specifically claimed that they had a role in planning or executing the murderous truck rampage. Known to local authorities for petty theft and street fighting, Bouhlel was not on any terrorist watch list. French Interior Minister Bernard Cazeneuve said there was evidence that he was ‘‘radicalized very quickly.’‘ Five people, including Bouhlel's ex-wife, were in custody being questioned. 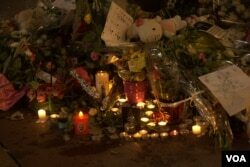 At the memorial along the promenade, locals and tourists lay flowers, dolls and notes in piles. 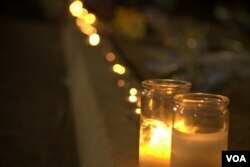 A large, colorful sign read, “We are Nice.” As the sun fell, candles were lit and the crowds thickened. 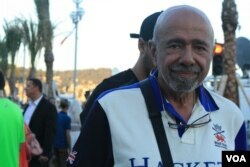 Najib Trad, a 63-year-old Lebanese advertising executive, came to Nice for a holiday on Thursday. He and his wife were watching the fireworks from their hotel when the mayhem began. “We saw the people running like crazy,” he said. Despite a rash of attacks in Europe over the past year and a half — among them two major attacks in Paris and the Brussels bombings that collectively killed nearly 175 people — Trad said it was still hard to see violence in a country long considered safe. Carla Jaquet, rocking her infant, disagreed. She is originally from Peru, where civil war between 1980 and 2000 killed 70,000 people.